Henderson's checker-mallow is a native plant species found in wet meadows, estuaries and tidal flats in southwestern British Columbia. Perennial herb from a strong taproot and short spreading rhizomes; stems erect or decumbent, hollow, purple-tinged, glabrous or nearly so at the base, 50-150 cm tall. 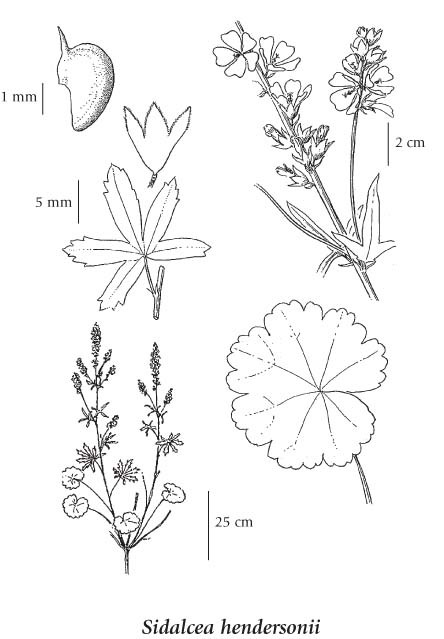 Basal leaves round or heart-shaped, shallowly lobed, toothed, long-stalked; stem leaves alternate, stalks reduced upwards, palmately 5-lobed into oblong segments; stipules purple-tinged. Inflorescence of numerous flowers in congested, compound, spike-like, terminal clusters on stalks 1-3 mm long; petals 5, deep pink, 1.5-2 cm long; calyces 9-15 mm long, 5-lobed, glabrous, fringed on the margins, bractlets lacking. Carpels, 4 mm long, 5-10, nearly glabrous, the beaks about 1 mm long; seeds 1. 1. Stigmas extending full length on the inner surfaces of the style branches. 1. Stigmas terminal and head-like. 3. Leaves mapleleaf-like or kidney-shaped and lobed; petals not yellow, colors various. Wet meadows, estuaries and tidal flats in the lowland zone; rare on S Vancouver Island, the Gulf Islands and adjacent lower mainland; S to OR.